Cement Concrete Flooring is commonly used both in residential as well as public buildings. The method of laying cement concrete flooring on ground floor of a building can be broadly divided in the following steps. The earth filling in plinth is consolidated thoroughly so as to ensure that no loose pockets are left in the whole area. A 10 to 15 cm. thick layer of clean coarse sand is then spread over the whole area. The sand layer a consolidated and dressed to the required level and slope. The base concrete used under floors may be cement concrete or lime concrete laid to a thickness varying from 75 to 10 cm. In case of cement concrete, the mix commonly used is 1:5:10 (1 cement: 5 sand : 10 stone or over burnt brick aggregates 40 mm. nominal size). Lime concrete, if used, should be made up out of 40 mm. nominal size stone/over burnt brick aggregate and 40% mortar comprising of 1 lime : 2 sand/surkhi or 1 lime : 1 surkhi/ash : 1 sand. The base concrete layer is deposited over the whole area, thoroughly lamped and levelled to a rough surface. When the base concrete layer has fully set and hardened, its surface is thoroughly cleaned and the entire area is divided into rectangular or square panels by use of 4 mm, thick glass strips or 5 mm, thick plain asbestos strips. The size of panel is basically governed by the location of floor (exposed or indoor), temperature and other climatic conditions, thickness of topping and proportions of ingredients in concrete mix. etc. In general, the area of one such panel should not preferably be more than 2 sq. m. The surface of base concrete should be made damp and applied with a coat of neat cement slurry prior to laying the topping., The rough finished surface of base concrete coated with cement slurry ensures adequate bond between the base and the topping. The cement concrete topping, normally consisting of 1:2:4 (1 cement :2 sand : 4 stone aggregate) is then laid in required thickness in one operation in the panels. The concrete is spread evenly by using a straight edge and the surface is thoroughly tamped and floated with wooden floates till the cream of the mortar comes at top. The surface is then smoothened and finally finished by means of steel trowels. In case glass or plain asbestos strips are not required, the panels are formed by use of wooden or angle iron battens. The battens should have depth equivalent to that of concrete topping. The surface of the battens which is to come in contact with concrete, is coated with raw linseed oil before concreting. Concrete for the topping is then laid in alternate panels and finished as described above. The battens used for forming panels are removed next day and the topping concrete laid in the alternate panels. In case the cement concrete flooring is to be laid over R.C.C. 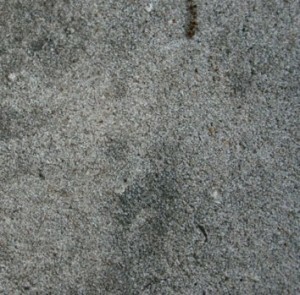 slab, it is usual to allow the slab concrete to harden and then lay the flooring. Prior to laying, the slab top is cleaned of all dirt, dust, loose particles, mortar droppings and debris etc. and the flooring laid as described under the sub-head ‘laying of topping’ above. In order to prevent the tendency of separation of the. cement concrete flooring from the R.C.C. slab, a 20 mm. thick cushioning layer of lime mortar (1 lime : 2 sand/surkhi or/lime : 1 surkhi/sand) or 50 to 75 mm. thick lime concrete is sometimes provided between the R.C.C. slab and the cement concrete flooring. If the working conditions permit, the flooring can also be laid monolithically over the R.C.C. slab while the slab concrete is still green. In this case, the slab concrete is roughened with wire brushes so as to ensure a good bond between the base and the flooring layer. Prior to laying of flooring, the slab surface is cleaned and a coat of cement slurry is applied over it. In this case, any slope required for the floor is given in structural concrete itself. The flooring should be cured for 10 days before use. It is non-absorbent and thus it is very useful for water stores. It is durable and hence it is commonly used in kitchens, bathrooms, schools, hospitals, drawing rooms etc. cement concrete flooring smooth and pleasing in appearance. It is economical and has the advantages of costlier types of floors. It possesses good wearing properties and can be easily maintained clean. Detects in carelessly made floor cannot be rectified, and as such, it requires proper attention while laying. Cement concrete flooringcannot be satisfactorily repaired by patch work.